August was a whirlwind of weddings for me. One of the weddings I had the pleasure of coordinating was Amy & Scott R. Their family & friends flew to Hawaii from all over to be a part of this special event. They were such a fun couple! 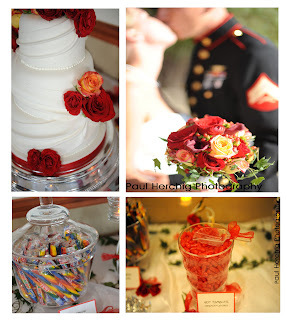 We created a beautiful candy buffet, with sweet treats for the guests to take home. Sunshine Cake Creations made a fabulous cake, exactly to the bride's specifications.